Anna Stina (Sophie) Hagman was a ballet dancer at the Kungliga (royal) Opera and the official mistress of Duke Fredrik Adolf. Sophie Hagman was born in Eskilstuna in 1758. She was the daughter of Peter and Elisabet Hedman, who also had two other daughters, Christina Catharina and Elisabet. Peter Hedman became a burgess of Eskilstuna in 1754. The family moved, in 1762, to Lovön in Stockholm where Peter Hedman worked for his brother-in-law Anders Erling, who was a ship’s carpenter. Sophie Hagman’s brother, Carl Peter Hagman, was born in 1766 and just a year later her mother died from the effects of cancer. That same year Peter Hagman remarried, to Christina Wigren, a maid. She and Peter Hagman both died in 1772. Thus, at the age of 13, Sophie Hagman became an orphan. Initially she continued to live with Anders Erling, but sometime between 1772 and 1775 – when she made her stage debut – she entered service as a nanny for Gasparine Becheroni, a singer with the Italian opera to the court, and her husband, Louis Gallodier, a French ballet master. It was probably in this household that Sophie Hagman learned to speak French and became acquainted with the Stockholm theatre world. Sophie Hagman’s career as a ballet dancer was not a lengthy one. On 24 April 1775 she performed in Pierre de La Garde’s ballet Aeglé and in 1776 she was in Francesco Antonia Uttini’s opera Aline, drottning av Golconda. Sophie Hagman was still referred to as ‘figurantska’, namely a dancer, at the Kungliga Opera in 1778. It is likely that that was the year her relationship with Duke Fredrik Adolf began as she very soon stopped dancing after that. One year later she was living with the duke at Kina castle at Drottningholm. In January of the following year, 1780, she was presented to the Crown Prince (future King Gustaf III) at Gripsholm. There are many sources which describe how Sophie Hagman lived in the duke’s shadow but they are difficult to confirm. However, the sources do agree on how Sophie Hagman’s contemporaries viewed her. She was admired by many, and her judgement, her understanding of etiquette and what was appropriate, as well as her talent for conversing and entertaining engendered respect in everyone she met. She also garnered attention for her beauty. Little information exists on her influence on the duke and that which does mainly refers to her calming influence. 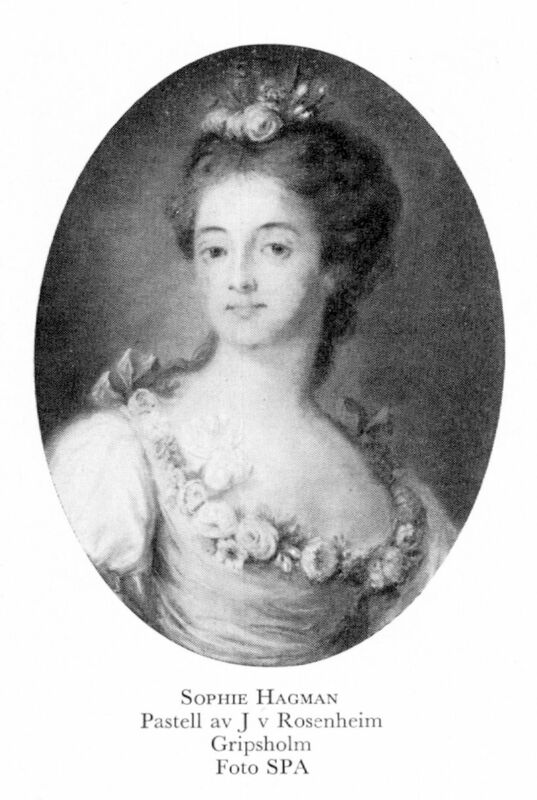 In 1780 Duke Fredrik Adolf fell in love with Margareta Lovisa Wrangel. He was given permission to marry her but soon tired of her and ended the relationship. Instead he returned to Sophie Hagman. They had a daughter, born in February 1787, who was christened Sophia Fredrica. The register of births does not include the parents’ names, but both the duke and Sophie Hagman are listed as godparents, along with the chamberlain Adolf Piper, the knight Per Reinhold Tersmeden, Count Carl Posse, the knight Per Sparre, and Professor Schulzenheim. There is no other information to be had on this girl who appears to have died shortly after birth. Sophie Hagman and Fredrik Adolf ended their relationship in 1793. During her time with the duke she had received Såby in Fröstuna and Vappersta in Vagnhärad, near Tullgarn where she spent a lot of time with the duke. She also purchased properties in Stockholm, mainly on Norrmalm. She received a pension from the court which covered her maintenance costs until her death. According to the rumours of the day Sophie Hagman had entered into relationships with other men, both while she was with the duke and after they broke up. Sophie Hagman travelled to Denmark and France following the break up. From 1800 onward she lived at Regeringsgatan with her sister, Elisabet Bjurström, and her children Sophie, Augusta, and Petter. Augusta Bjurström later became a school director and established a women’s training institution in Stockholm. Sophie Hagman’s final years were spent enjoying a vibrant social life and a reputable social standing. She socialised with Johan Tobias Sergel and Carl Michael Bellman. Her home was described as pleasant but not extravagant, and this impression is confirmed in the inventory of her estate. She died on 6 May 1826. At that time she lived in the Skansen number 4 area, which today corresponds to Drottninggatan 40. Anna Stina (Sophie) Hagman, www.skbl.se/sv/artikel/SophieHagman, Svenskt kvinnobiografiskt lexikon (article by Marie Steinrud), retrieved 2019-04-26.